Clare Hughes and Kath Lambert founded Alexander Swimming in 2006. We are both graduates of the Shaw method diploma course. 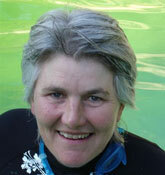 Clare is an experienced Alexander Technique teacher and Kath spent years as a competitive swimmer in her youth. I have always enjoyed being in the water and love swimming outside. Living in Brighton, I regularly swim in the sea (although not in the winter!). I qualified to teach the Alexander Technique in 1980 and have taught continuously since then. This includes working on an Alexander training course for 12 years where I became Assistant Director. It was through the Alexander Technique that I heard of the Shaw Method of swimming. Taking lessons inspired me to swim more and get greater benefit from being in the water including improving my level of fitness and lowering my stress levels. It also enhanced my general sense of well being. 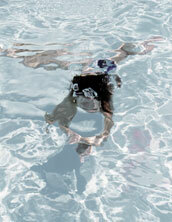 The water tends to magnify our habitual muscular patterns and is a wonderful medium in which to work on body awareness. I completed the Shaw Diploma in 2004 and find it both rewarding and challenging to work with people of all ages and abilities. 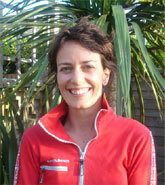 I currently teach swimming in small groups and on an individual basis. I also maintain my Alexander practice in central Brighton where I can often be found taking pupils through the “dry land” swimming practices. I swam competitively from the age of 9 years until university where I captained the swimming team. Desk job after desk job followed so whilst training and competing lost their appeal I swam regularly to keep fit and relieve stress. Being confident in the water also enabled me to participate in other sports such as rowing, windsurfing, surfing and triathlon. As well as being an antidote to office life, the fact that I’ve been able to embrace these opportunities makes me eternally grateful that I was taught to swim in the first place. No longer dodging the traffic on my pushbike to work in London, I live 5 minutes from the beach near Brighton. I teach all ages and all levels of swimmers, both individually and in groups. My Shaw Method training gives me a different perspective to a traditional swimming teacher and complements the more conventional teaching and training methods I’ve been utilising for the past 20 years.